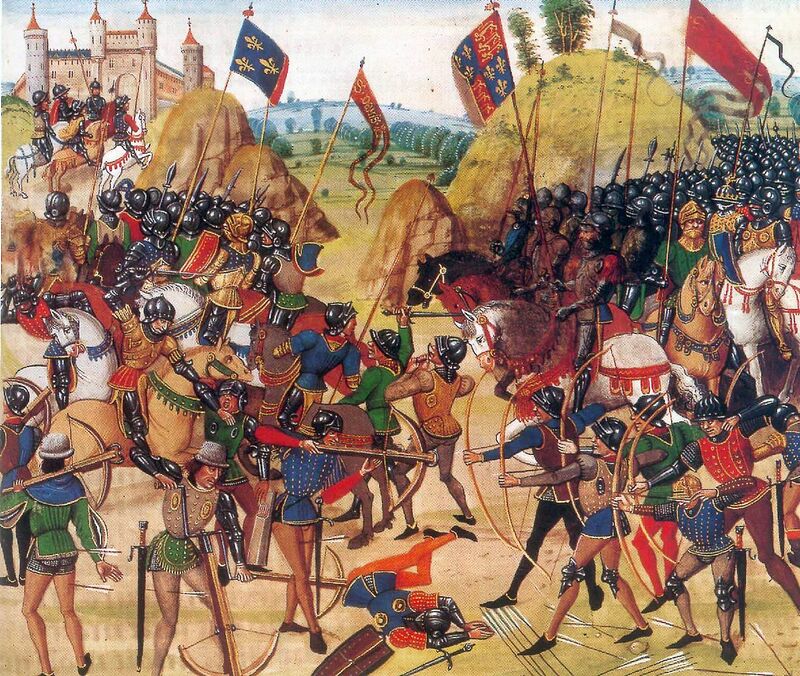 As Geoffrey Parker explained, “The verdict of battle at Crecy (1346), Poitiers (1356), Agincourt (1415), and countless other lesser encounters confirmed that a charge by heavy cavalry could be stopped by archery volleys.”[ii] Modern, “…explanations for the English dominance have tended to emphasize the importance of the archers’ clothyard shafts fired from prepared positions, on the indiscipline of French armies, and on the inherent superiority of disciplined infantry to cavalry.”[iii] Barbara Tuchman: “England’s advantage lay in combining the use of those excluded from chivalry – the Welsh knifemen, the pikemen, and above all, the trained yeomen who puled the longbow – with the action of the armored knight.”[iv] Or, “The penetration power of the longbow made mail armor essentially useless against the missile weapon.”[v] And again, “The rare efforts when [chivalry] were stupidly committed unsupported by combined arms to a frontal assault against well deployed men fighting on foot generally resulted in disaster for the horsemen.”[vi] Crecy is an excellent case study with which to examine these hypotheses. 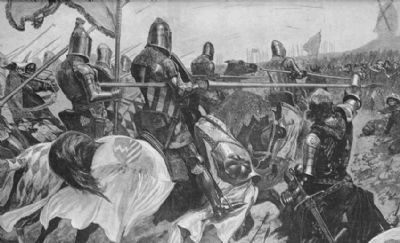 The battle of Crecy was the result of a complex series of events, but the essential component was the dynastic struggle between the heirs of the Angevin Empire to contest the throne of France. 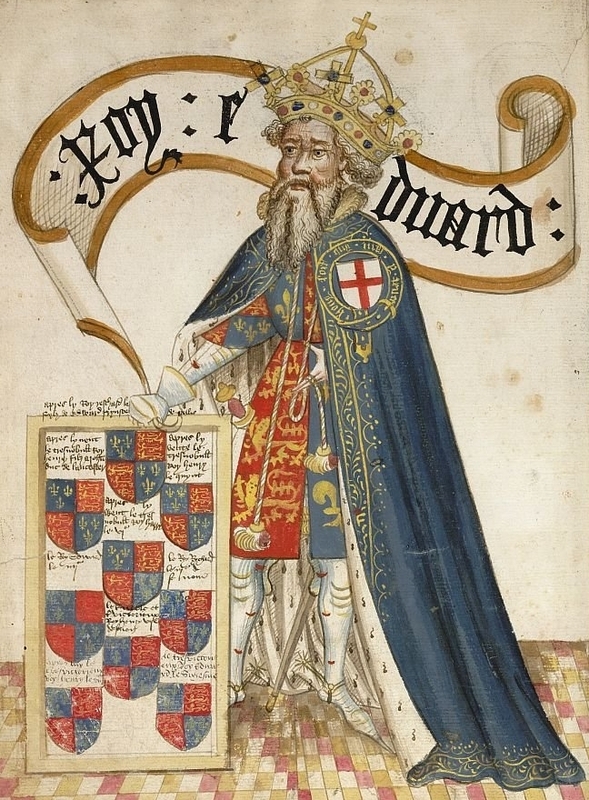 Edward III Plantagenet’s objective was to reverse the expansion of France engineered by Philip II Capetian, the first titled King of France, in the 12th and early 13th centuries. Edward’s ally, the Duke of Brittany, John III, died in April 1341, resulting in a succession crisis. 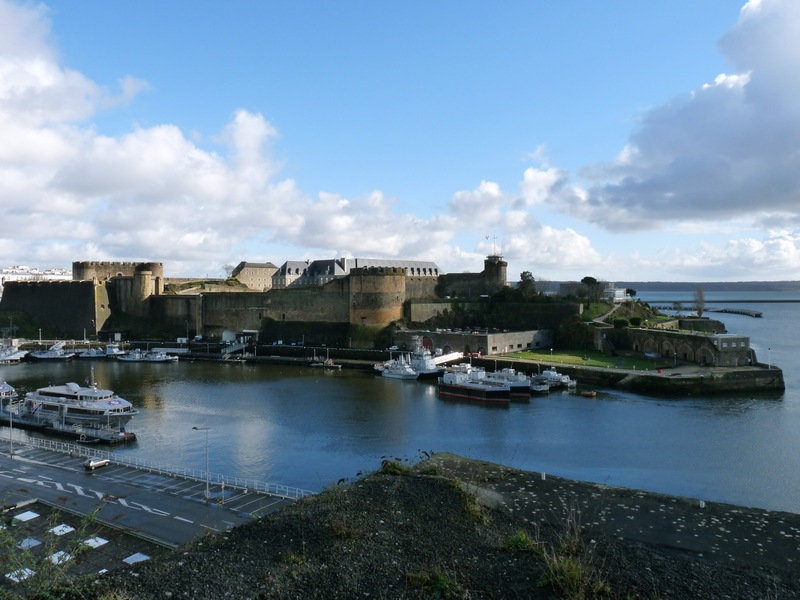 [xxxi] More campaigns followed, first in Scotland and then the continent, with Edward landing in Brittany in October 1342. 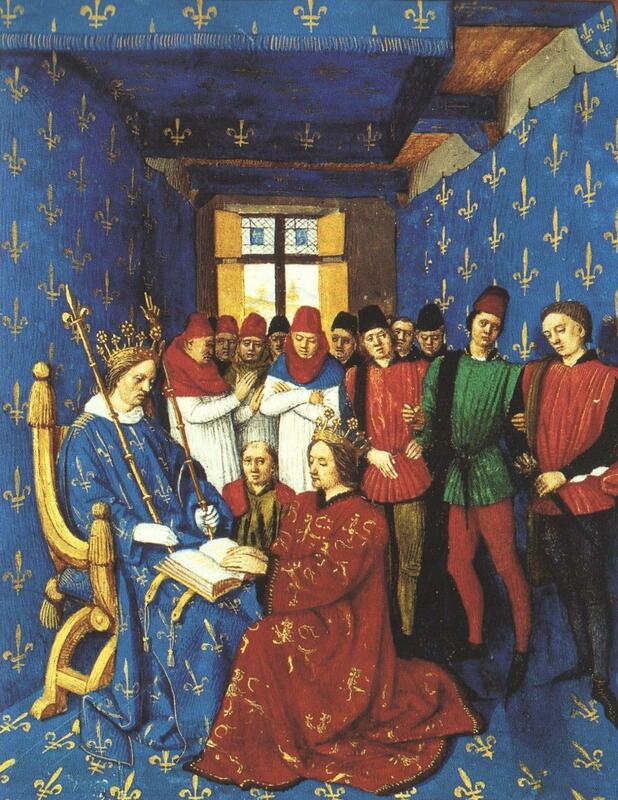 Failed peace negotiations at Avignon in 1344, compounded by the illiquidity of the Florentine firms bankrolling the English war effort,[xxxv] forced Edward to stake a military claim commensurate to his political claim for the throne of France. War by proxy in Brittany had not achieved the desired aims. 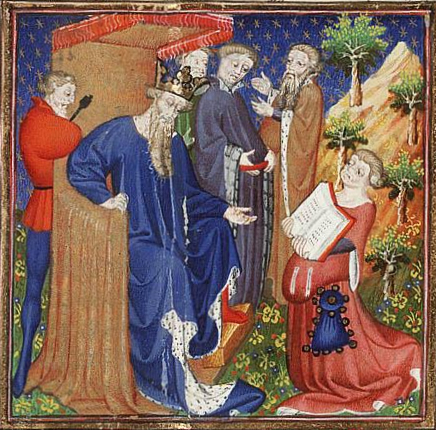 In 1346 John of Hainault, along with many of Edward’s other allies, had switched sides or deserted the cause. These political-economic developments placed the English King in a precarious situation. Heading north, Edward crossed the Somme by ford on 22 August, and captured the defenders Philip had situated to block Edward’s route. 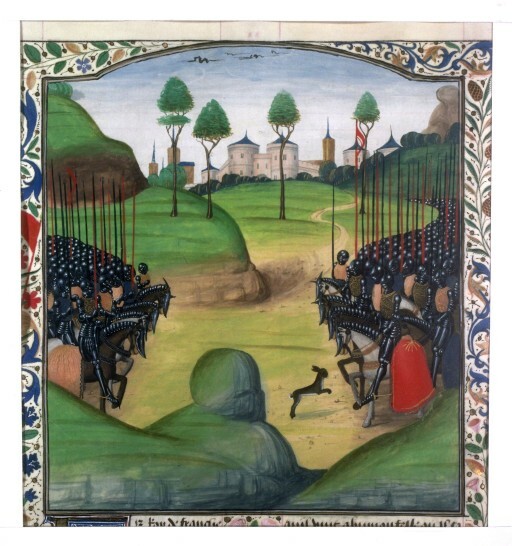 Harassed by Philip’s vanguard, on 25 August, Edward was prepared to accept battle. He thus moved the army into a defensive position on the hills north of the village of Crecy. [lxxiii] Edward’s position was strong: he was now well supplied by captured victuals from Le Crotoy, and he presently expected the arrival of his Flemish allies under Hugh Hastings (although in fact, the Flemish contingent was retreating without knowledge of Edward’s situation). 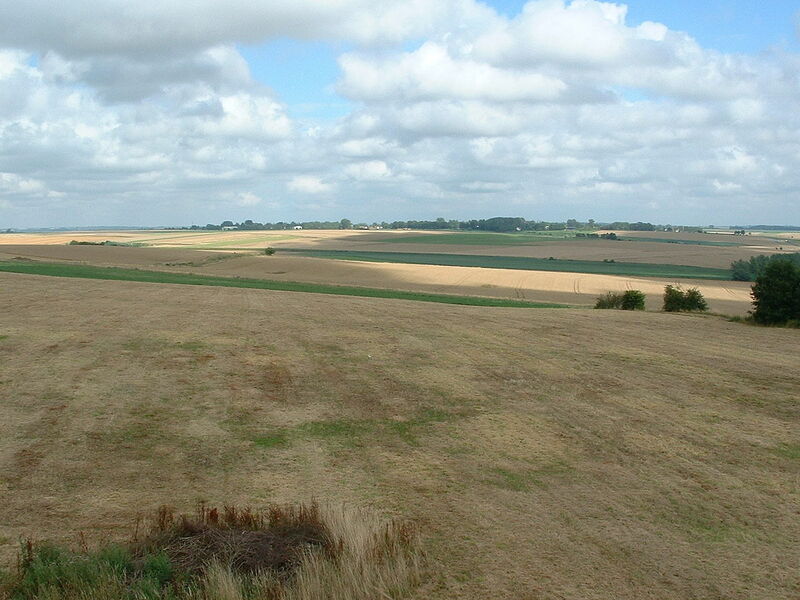 [lxxiv] Philip rested the army at Abbeville, 14 miles by road from Crecy. [lxxv] The two armies confronted each other on the following day, 26 August 1346. The size of Philip’s army is largely conjecture. Some estimates place it at 60,000 men; 4,000 to 6,000 Genoese crossbows, and 8,000 to 12,000 cavalry. [xciii] A conservative estimate is a total of 20,000 men, plus between 200 to 2,000 crossbows: twice the size of Edward’s army. [xciv] The first division of cavalry was led by King John of Bohemia (the blind) supported by Philip’s brother, Charles Duke of Alencon, a veteran of the Brittany campaigns. Carlo Grimaldi and Otto Doria commanded the Genoese component. [xcv] Philip’s army was assembled in part by “’lettres de retenue’”- essentially mercenary contracts that pledged the contractor to fight during a certain period of time and for a specified sum. 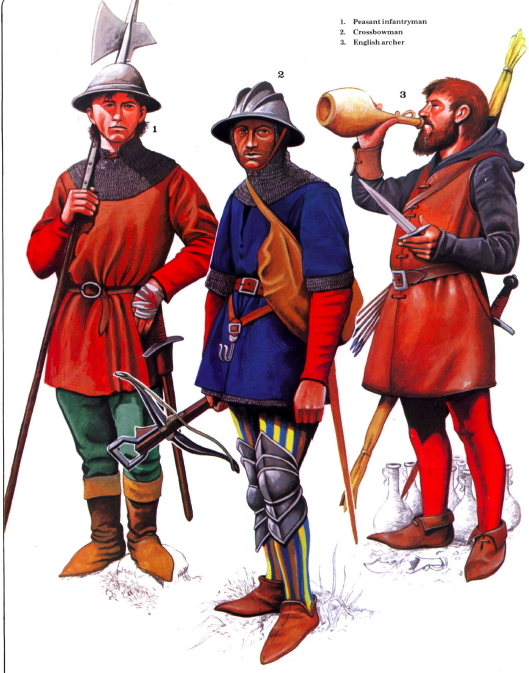 [xcvi] In 1340, six years before Crecy, 28.5% of the royal army was composed of foreign mercenaries. 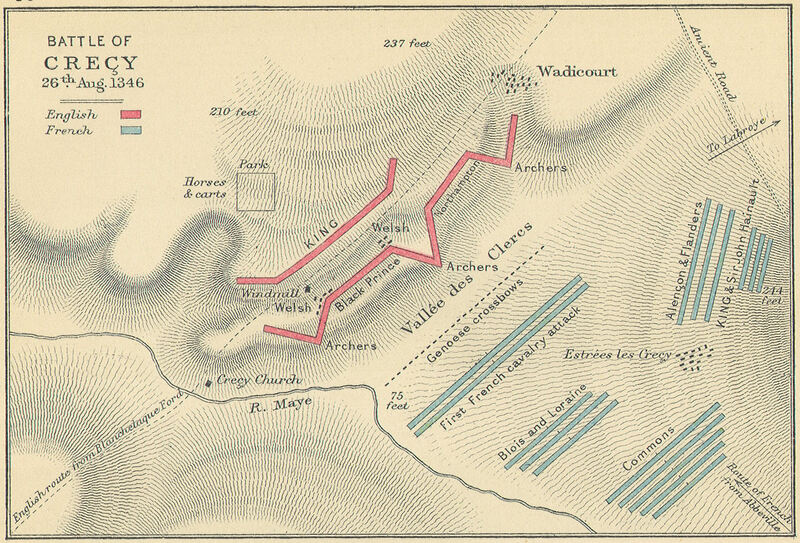 [xcvii] Contingents from Flanders, Picardy, Normandy, Paris, Burgundy and Loire were all present at the battle. 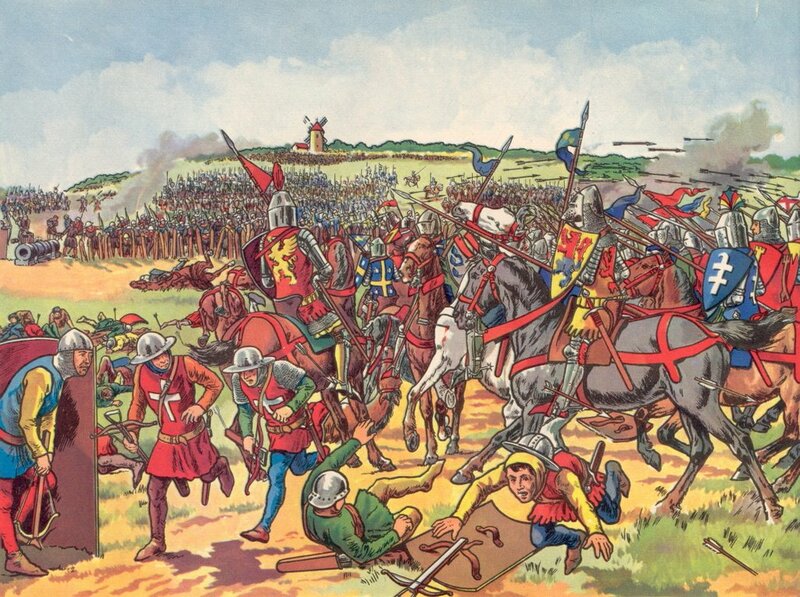 [xcviii] The French were tired when they arrived, having marched from Abbeville; whereas the English forces were well rested, fed, and had spent the day preparing. Philip rose at sunrise and heard mass at St. Peter’s in Abbeville before setting out with the army to confront Edward. [xcix] The army arrived about 4 pm, with the sun setting behind the English. [c] Philip was recommended to delay until the following morning, a suggestion he approved of, but the confusion of the situation, combined with the impatience of the forward ranks of the French army, pushed the battle beyond Philip’s control. 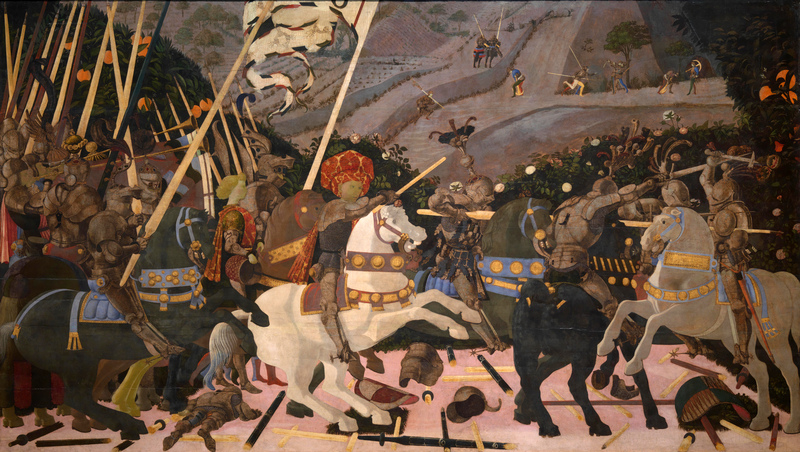 The Battle of San Romano, Paolo Uccello, c. 1438-40, National Gallery London, depicting battle between Florentine and Sienese forces in 1432. [cxx] Note heavily armoured knights and unarmoured horses. 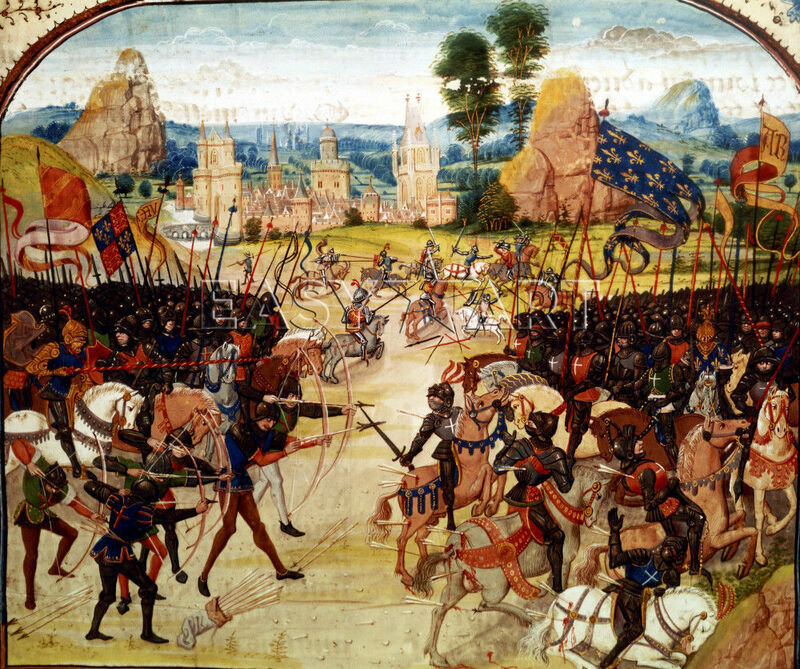 Modern depiction of Crecy, showing French cavalry charging through the Genoese crossbow line. Note fieldworks and cannon at English position. [cxxvi] Note also Genoese crossbow shields- not present at the battle. 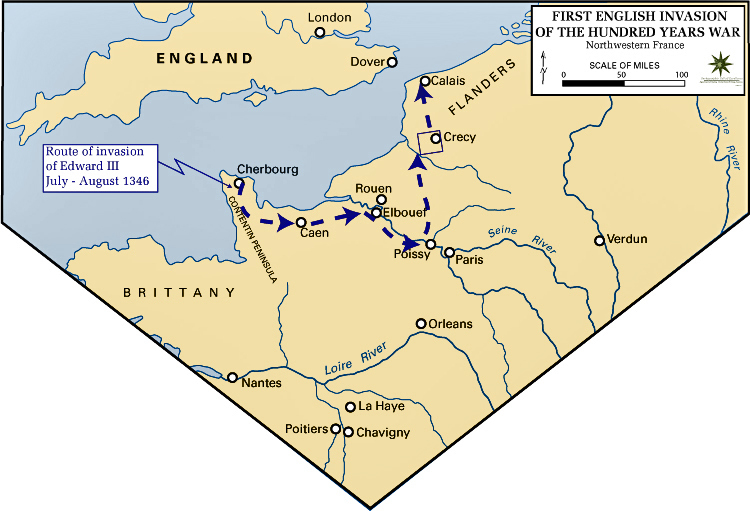 The English sieged Calais on 3 September 1346. Early in 1347 Philip was rebuilding his army, however, he was unwilling to take the field. 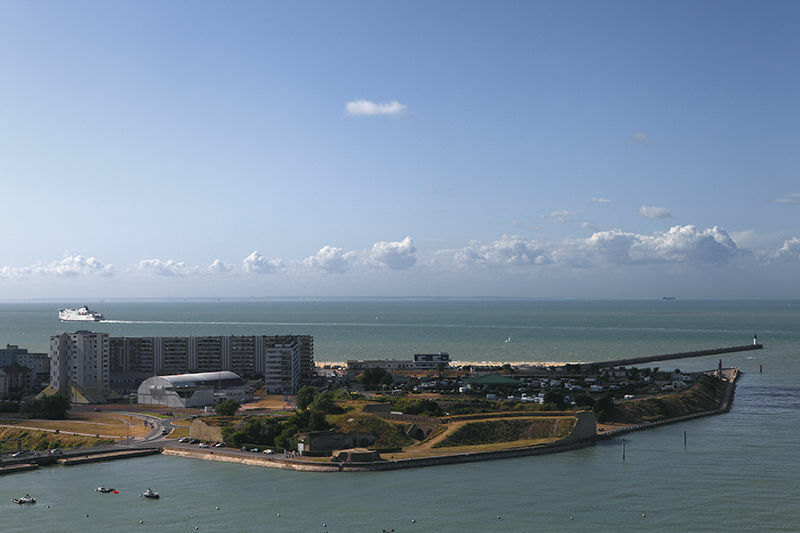 Edward now “ordered the recruitment of 7,200 archers, as well as calling on the services of the Earls of Lancaster, Oxford, Gloucester, Pembroke, Hereford and Devon.”[cxxx] The eleven month siege concluded with Calais’ surrender on 4 August 1347, and was followed shortly thereafter by the ceasefire of 28 September. 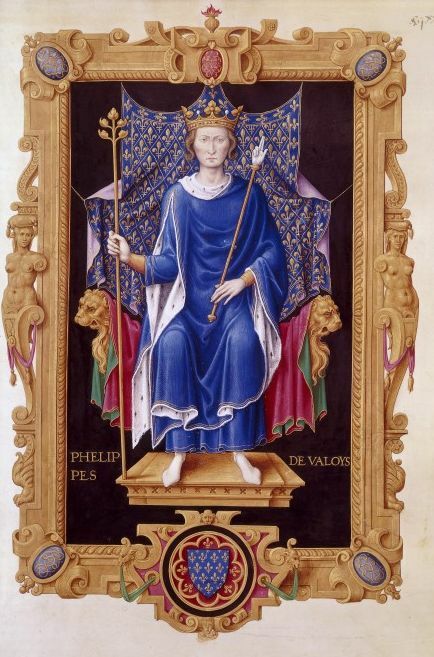 [cxxxi] Philip VI secured an alliance with Castile and the war was continued at sea through 1349. [cxxxii] It was now that the bubonic plague spread throughout Europe: experts predicted the end of the world. 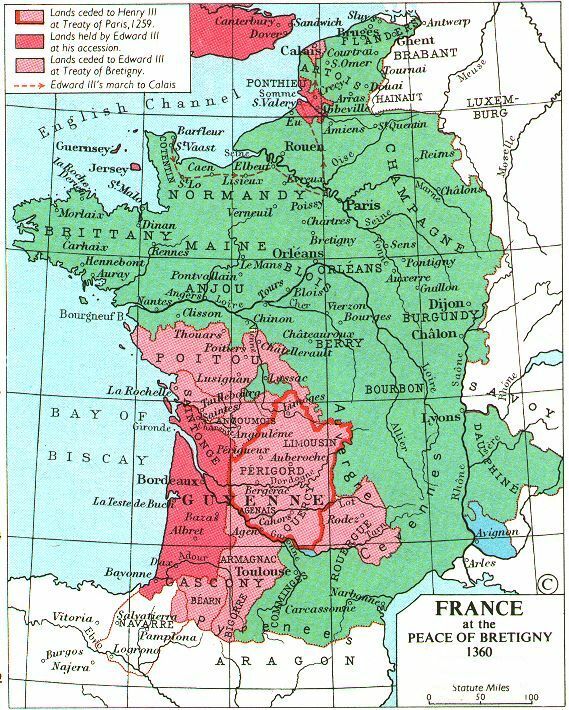 Treaty of Bretigny, 1360. 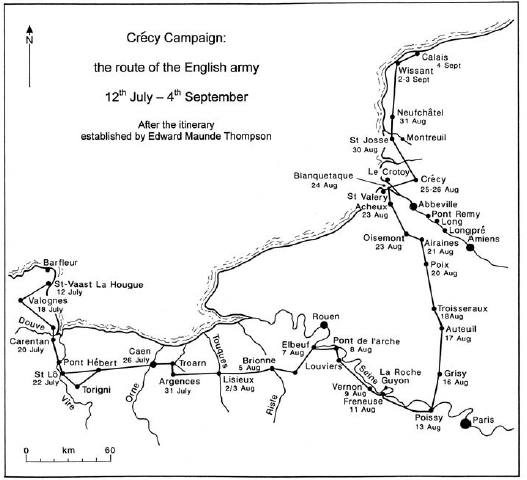 Note also Edward III’s route from Normandy to Calais. [cxxxviii] In addition to territorial concessions, the treaty of Bretigny arranged for the payment of King Jean’s ransom. Edward’s gains were not to last. The campaigns of Charles V Valois reversed Edward III’s success, resulting in the Treaty of Bruges (1375). 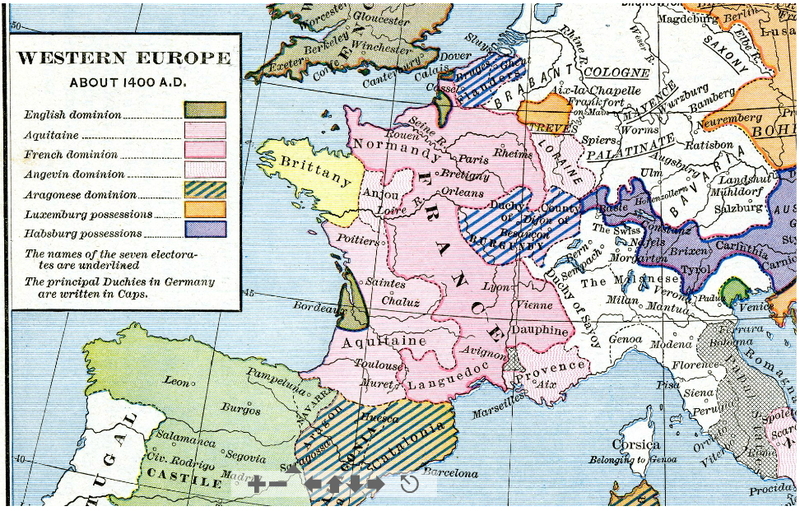 When Edward died in 1377, England’s holdings in France had been reduced to the rump of Bordeaux and the fortresses of Calais and Brest- the latter held until 1397. 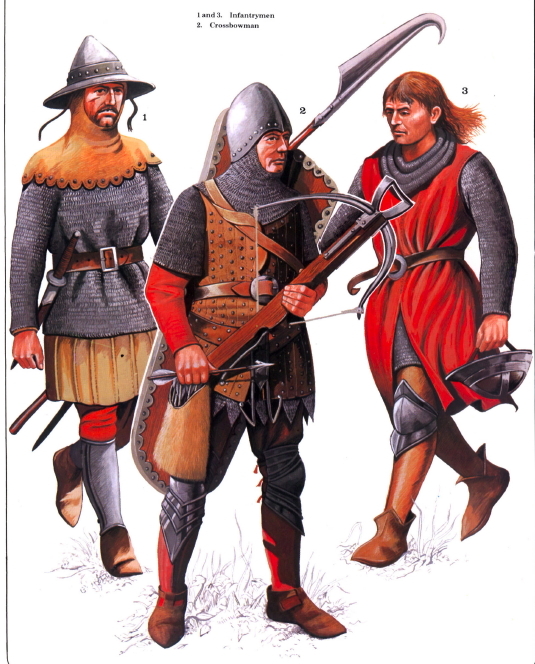 [cxl] Armourers in France, Italy and England, meanwhile, responded to the infantry revolution by improvements to plate armour technology over the half century from 1350 to 1400. 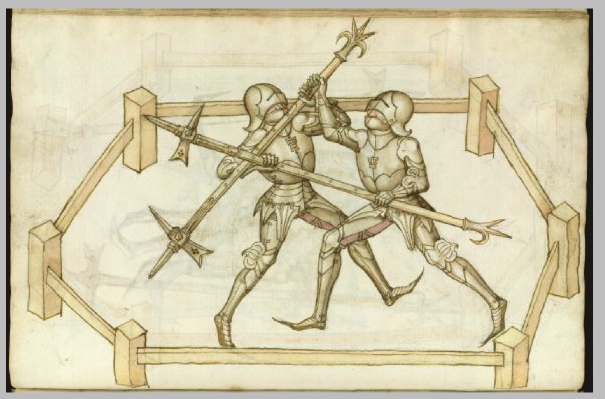 The knight could now rely on full-body plate to generally protect against the longbow. [cxli] Ultimately, English reliance on the longbow was a weakness: skilled bowmen could not be trained in the numbers required for the ongoing campaigns in France. Gunpowder, the great leveler, was set to revolutionize European warfare. 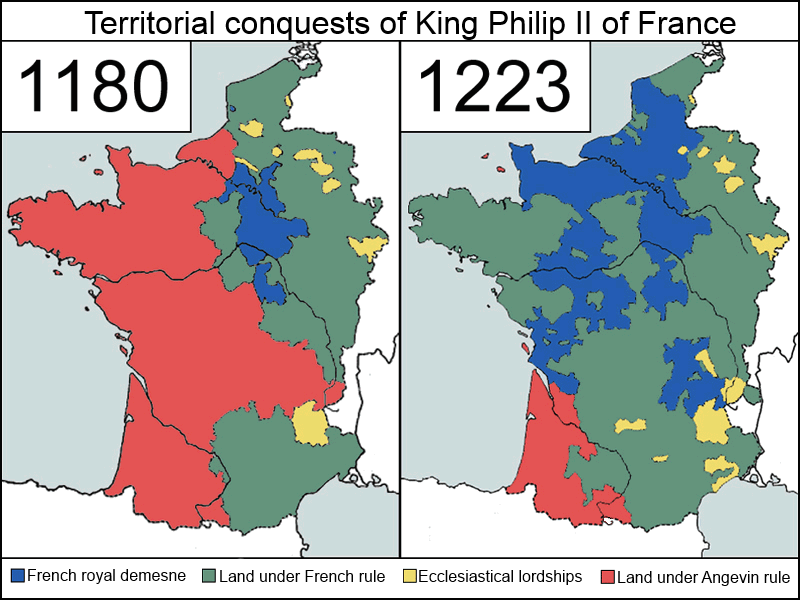 [cxlii] The groundwork was prepared for the second phase of the Hundred Years War. [xlvii] Ibid., p, 339, Jan Willem Honig, “Reappraising Late Medieval Strategy: The Example of the 1415 Agincourt Campaign,” War in History 19, no. 2 (2012): 123–51. 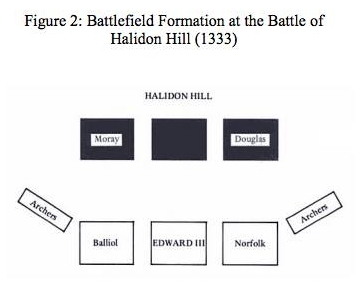 [cvii] Ibid., Keegan, The Face of Battle, A Study of Agincourt, Waterloo and The Somme., Thom Richardson, “Armour in England, 1325-99,” Journal of Medieval History 37 (2011): 304–20. 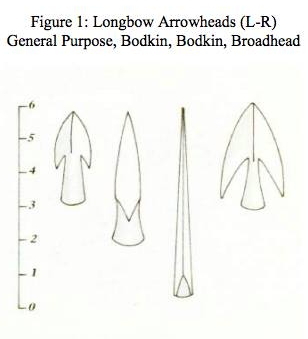 [cxxi] Mortimer, “Tactics, Strategy, and Battlefield Formation During the Hundred Years War: The Role of the Longbow in the ‘Infantry Revolution.’”, p. 32, figure 1. [cxxxvi] http://images.easyart.com/highres_images/easyart/3/0/301947.jpg; Tuchman, A Distant Mirror, The Calamitous 14th Century., p. 234, plate 4. This entry was posted in Land Battle, Medieval Warfare, Military Campaign and tagged Battle of Crecy, Cavalry, Chivalry, Edward III, Hundred Years War, Longbow, Philip VI. Bookmark the permalink.